Time for a major, and that means there’s a bunch more to watch for than a normal Tour event! Aren’t you proud of me for not naming this article something clickbaity like “9 things to watch for this US Open!” Boo clickbait. Funny groupings — In the past, the USGA has made some funny groupings, with 3somes that have been the “young bombers” grouping (possibly filled this year with the Brooks Keopka, Ben An, and Russell Henley group), the “really tall people” grouping (don’t know about that this year), and even the “fat guy group” which I think featured guys whose nicknames were “The Walrus” and “Lumpy”. This year, there aren’t as many groupings I could find that were as funny as the fat guy group, but we have a few. There’s the “Former Champs who are Foreign” group featuring Geoff Ogilvy, Ernie Els, and Retief Goosen. And there’s the “Masters Champs who haven’t won a US Open” after a comment reminding me that Angel won the 2007 US Open at Oakmont (how can I forget that), I’m renaming this the “Masters Champs where only one guy won the US Open, and he’s probably considered the worst of the three” group of Phil Mickelson, Bubba Watson, and Angel Cabrera. Rolls right off the tongue.. So even though the USGA has become a little more PC, we still get a couple theme groups. No-names leading after the first round — Considering the US Open has few automatic qualifiers, and only 36 holes to determine the rest of the field, you end up with a decent number of randos in the field. And given the quirkiness of the course, and the number of low level pros in the field, I’ll guarantee there’s gonna be at least one no name with a good story near the top of the leaderboard after the first round. (a) — That little a that you see next to players names near the bottom of the leaderboard? That means the player is an amateur. Amateur meaning that they can’t accept prize money for tournaments. Well that’s kind of the case. They can still get up to $550 in gift certificates from the tournament venue (which a lot of state level tournaments have), as well as are able to get clubs from sponsors who are eyeing to sign them for contracts for when they turn professional, since pretty much all of them are going to do that. But at least for now, amateurs playing in the US Open is pretty special. People complaining about the course — Since the media thrives on controversy, I guarantee that they’re going to play up any bit of criticism that players give either the course or its setup this week. Really though, I’ll say that it’s players frustrated with their play, or that they’re not as familiar with the course as they usually are which’ll prompt the criticism. The USGA knows what it’s doing setting up the course. People praising the course — Oh yeah, I’m sure you’ll see some stories about the course where they link to quotes about players praising the course as well. Gotta have both sides to the story! And looks like everyone’s favorite critic Ian Poulter is being mum on the issue until the tournament is over. 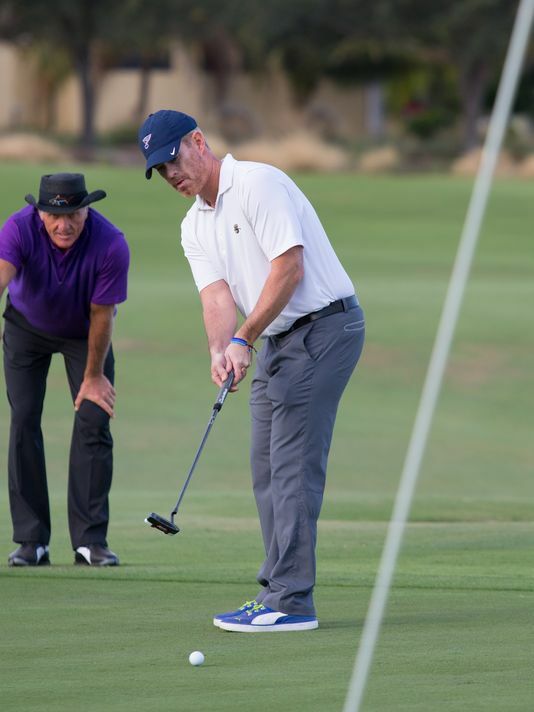 Joe Buck and Greg Norman — No more NBC, with Fox buying the rights to show the US Open for the next 10 years. And with Fox, we get everyone’s favorite announcer Joe Buck!!! Sarcasm aside, I don’t get why everyone is so against Buck. He’s done high profile sporting events for so long now, that he can’t be bad otherwise they would have replaced him. People say that he doesn’t get as excited as he should, but I don’t like it when the announcer starts shouting about a play. The play should yell for itself. I am curious to see how he does considering I don’t think he’s ever announced a golf tournament before. But frankly, I’m sure he’ll be just fine. Really long drives — The course is listed at 7.7k yards. Granted, it probably won’t play that long for any one round, even a possibility of a course of that length means one thing — it’s gonna be really dry out there, and there are going to be really long drives. A wet course that’s 7.7k yards isn’t fair, and the USGA knows that. But a little downwind with the fescue fairways and you’ll see guys getting it out there 380 yards. And that’s how you turn a 500 yard par 4 into a driver and a flip sand wedge. Trains! — Choo choo! 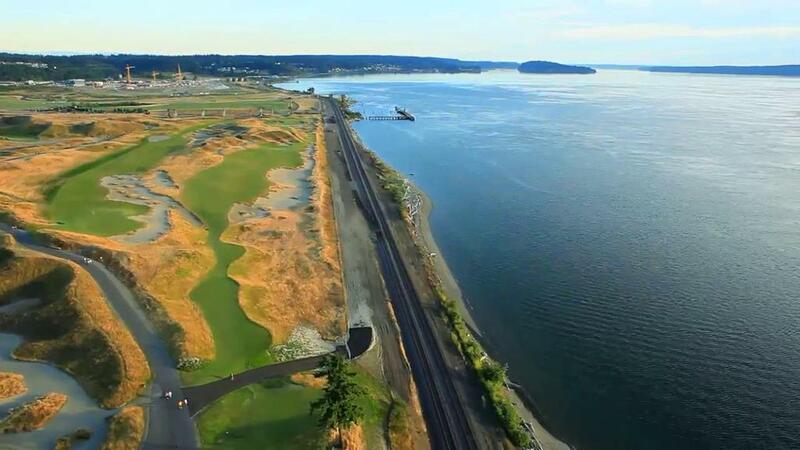 One of the more unique things about Chambers Bay are the train tracks that run past the course. Not actually sure it they’ll let the trains run during the US Open, but I’m sure the media is going to play that part of the golf course up as much as they can. Imagine Thomas chugging his little heart out on those tracks. The West Coast — Torrey Pines recently (no idea why that’s a US Open course), and Pebble are the only others. Look back on that list of past venues and they’re all east of the Mississippi. Good for TV when you can use the late setting sun on the West coast to show the tournament in prime time on the East coast. Less fun for us though in that we have to wait around for longer to watch the coverage. Oh well, at the British Open in a month we’ll get to wake up at 6 in the morning and see the tournament. Good times. Angel Cabrera won the U.S. Open in 2007. The US Open — Who’s Going to Win, the Players or the Course?